Animations : Made by me, Mask0112, HERE. Mask: Made by me, HERE. Open Paper 9 from kit "Bibi Katy Love". Duplicate and close original. Re-size by 60% at 72 dpi and check Smart Size. Right click in layers palette and promote background to layer. Open your mask of choice in PSP. I'm using Mask0112-SophisticatSimone. Activate your paper. Go to Layers, New Mask Layer, From Image. In drop down list find your mask and select. and make sure Invert mask data is UN-checked. Copy and paste element 83 as a new layer and re-size by 75%. Move a little to the left and add drop shadow. Copy and paste element 28 as a new layer and re-size by 45%. Move to the left in front of tree and add drop shadow. Copy and paste element 60 as a new layer and re-size by 25%. Place anywhere on your tree and add drop shadow. Copy and paste element 9 as a new layer and re-size by 30%. Mirror image and place anywhere on your tree and add drop shadow. Copy and paste element 61 as a new layer and re-size by 94%. Move to the bottom of tag in front of tree layer. Copy and paste your tube as a new layer. Place her/him on top of grass layer. Copy and paste element 26 as a new layer and re-size by 90%. This layer should be between your mask layer and your tree layer. You will notice a hard edge on the right hand side. Using your selection tool set to 20 feather, just select a small portion of that edge and delete. It should soften it up. Copy and paste element 41 as a new layer and re-size by 45%. Move this bird above your tube layer and place it on her knee and add drop shadow. Copy and paste element 30 as a new layer and re-size by 45%. Move the chest by the cat and add drop shadow. Copy and paste element 46 as a new layer and re-size by 22%. Move in front of tube at bottom of tag and add drop shadow. Copy and paste element 68 as a new layer and re-size by 40%. Move so the grass appears behind the tube and add drop shadow. Do the same for element 51. Add the sun, element 50 and re-size by 40. Move to the upper right hand side of tag. Copy and paste element 45 and re-size by 35%. Place at the bottom of tag in front of tube. Copy and paste element 82 and re-size by 35%. Place behind your cat element and in front of tree. Add drop shadow. Copy and paste element 66 and re-size by 50%. Place at your tubes knees and behind your tube. Add drop shadow. Copy and paste element 49 and re-size by 20%. Place at your tubes feet in front of tube and add drop shadow.Duplicate and move to the left side in front of chest. Paste again as a new layer and re-size by 25%. Mirror and add drop shadow. Place in front of chest as well, but behind the 1st flower. Add any other element that you think would fill any blank spots and add to the overall look of your tag. Add artist copyright and scrap kit maker credit. Save your tag in layers. Make sure you've added drop shadows to all your layers. Grab your crop tool and on tool bar where it says Snap crop rectangle to: choose "merged opaque". Either click Apply or double click your tag. Add your name, merge all visible and save as a PNG. If you choose to animate, don't add your name yet. Tutorial written by SophisticatSimone aka Lorraine Halle on Sunday, April 28, 2013. Open paper 8 and duplicate. Close original. Re-sizy by 70% and promote background to layer. and use default settings, except change transparency to 0 (zero). Copy and paste element (89) as a new layer. Leave in center, but drap up to top of tag and add drop shadow. In layers palette, double click on this layer and the "Layers Properties" box will pop up. Put a check mark beside "highlight in layers palette" and then select a color of choice, I chose blue. Double click in the color box and you can choose the one you one. Click OK. We will need to remember this layer later. Copy and paste element (56) as a new layer. Re-size by 70%. Move behind the screen and over to the upper right hand side of tag. Move this layer a little bit lower, about half way down the screen element. Add large drop shadow to each. C/P E87 as a new layer. Move to upper left hand side of screen. Add D/S. C/P your tube as a new layer. Move to left side of screen. Add D/S. C/P E54 as a new layer. Re-size by 80%. This layer should be second to last, above your paper layer. Add D/S. C/P E84 as a new layer. Re-size by 60%. This layer should be your top layer now. Add D/S. C/P E53 as a new layer. Re-size by 20%. This layer should be your top layer and placed next to flag poll. Add D/S. C/P E17 as a new layer. Re-size by 20%. Move next to your tubes left foot. Add D/S. C/P E16 as a new layer. Re-size by 30%. Move so it appears to be sitting on roof on left side of tag. Add D/S. C/P E8 as a new layer. Re-size by 62%. Move behind tube layer and to the right hand side of tag, duplicate layer and re-size by 86% and move over to the right hand side of tag. Add D/S. Merge together and duplicate. Mirror. C/P E5 as a new layer. Re-size by 85% and place between your two pink leafy elements. Add D/S. C/P E21 as a new layer. Re-size by 18% and place in a few areas. I duplicate twice and added two at the bottom of tag and one of the right hand side on roof. Add D/S. C/P E64. Place at bottom right hand corner of tag. C/P E85. Re-size by 85%, place behind grass and flowers. Duplicate and mirror. Move over to the left hand side of tag. D/S all flowers. C/P E13. Place on right side of tag. Duplicate and re-size by 54% and mirror. Move back over to the right side of tag down low and behind the black flower. C/P E92 as a new layer and move to the upper left hand side. Add drop shadow. C/P Paper 2 as a new layer and drag it down to the bottom, above the previous paper. Re-size by 92%. Set blend mode to Multiply. C/P Paper 4 as a new layer and re-size by 32%. Move this layer down until it's above the layer you added a color too. Mine was blue. Hold your Ctrl key down and repeatedly hit letter L on your keyboard for a total of 16 frames. Position on your tag and click into place. I place mine just on her right arm. So more to the left side of tag. Tutorial written by SophisticatSimone aka Lorraine Halle on Saturday, April 27, 2013. Open paper 003 and duplicate. Close original. Re-size by 85%. Promote background to layer. This will be our working tag. Go to effects, plugins, Filters Unlimited (ICNET filters), Edges, Square, Square Edge 16. Open paper 006, shift D to duplicate. Close original. Re-size by 60%. Copy and paste as a new layer on your 1st paper. Leave in center of tag. Duplicate and move this copy a little to the left and a little to the bottom. Don't pass the mask border. Add small drop shadows to each. Copy and paste the arch, element (043) as a new layer, re-size by 70%, dpi 72 and smart size checked and move to the right side of tag. Copy and paste the leaf, element (035) as a new layer and re-size by 60%. Using your mover tool position leaf in the upper left hand corner of tag. Will readjust once our frame is on. Add drop shadow. Copy and paste the pocket watch, element (018) as a new layer. Using your mover tool position clock in the lower left hand corner of tag. We will readjust once our frame is on. Add drop shadow. Copy and paste the post card, element (010) as a new layer. Leave it in the center. Duplicate layer. Copy and paste the frame, element (046) as a new layer and re-size by 60%. Leave this layer in the center. Duplicate. Leave original as it. On duplicate layer change blend mode to : Hard light. Add drop shadow to the very bottom frame only. In layers palette activate the top post card layer. Now copy and paste element (040) as a new layer and position to the left a little and using your selection rectangle remove extra leaves from bottom of frame. Using your lasso tool, feather set to zero. Select a portion of those leaves and promote to new layer. Using your mover tool, move to the left upper edge of your frame. Make sure this layer in above your frame layer. You can rotate right or left if you want or you can mirror and flip and reposition so it's in the upper left hand side of tag. Play around and see what you like best. Add drop shadow to each layer. Copy and paste element (005) as a new layer and mirror and flip. Grab your magic wand, feather set to 0, tolerance set to 15 and click inside your frame layer (the bottom one). Go to Selections, Modify, Expand by 12. Now copy and paste your tube as a new layer. Using your mover tool position your tube inside the frame. Go to Selections, invert and delete extra from your tube layer. Go to selections and invert. 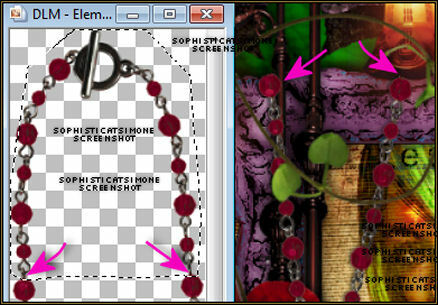 Click on leaf layer and hit delete, click on all elements you don't want showing up within your frame. Don't delete any of the paper layers or the post card layer. Go to selections and select NONE. On duplicate tube layer, set blend mode to : Luminance (L) and decrease opacity to 59. Copy and paste element (062) as a new layer and move below both tube layer. Using mover tool, position to the right upper hand side of frame/tag. Activate your top tube layer. Now copy and paste element (066) as a new layer and position the text in the upper right hand corner of frame. Using selection tool, remove any text outside the frame. Activate your top frame layer in layers palette. Copy and paste element (067) as a new layer. Copy and paste element (058) as a new layer and move to the left side of frame. Put a check mark beside "highlight in layers palette" and then select a color of choice. Copy and paste the books, element (009) as a new layer and bring low in front of frame. Copy and paste ribbon element (052) as a new layer and re-size by 75%. Position low on tag and add drop shadow. Copy and paste poppy flower element (031) as a new layer. Re-size by 25%. Move down low in front of pocket watch. Make sure this layer is behind the ribbon. Duplicate your flower and free rotate to the right by 90 degrees. Move this layer above the ribbon and position slightly to the left. Duplicate layer and move to the left side of tag on the frame about midway. Add drop shadow to each flower. In layers palette activate the bottom most flower layer. Now copy and paste element (069) as a new layer and move to the right of the tag. Copy and paste element (068) as a new layer and move to the right of the tag. Copy and paste violin element (059) as a new layer and move to the right side of frame, over it. Copy and paste flower element (033) as a new layer. Re-size and position on books near the bottom of violin. Add drop shadow. Copy and paste the mirror element (021) as a new layer and mirror and flip. Position to the left side of frame. Add drop shadow. Copy and paste shoes element (05) as a new layer. Duplicate and move slightly forward. Add drop shadow to each. Copy and paste element (022) as a new layer. Position so it looks draped over the frame. Grab your selection tool set to : point to point, feather 0. Click all around the top portion (the area you want to remove) and hit delete on your keyboard. Add drop shadow to the necklace. Copy and paste big silver ball element (003) as a new layer and position at the bottom of tag in front of books. Duplicate and re-size, move to the left a little bit. Add drop shadow to each. Copy and paste element (002) as a new layer and re-size. Move to the right side of tag, next to poppy flower. Add drop shadow. One by one, X-out all layers, all the way down to the high lighted layer, which is the double lantern. Skip the lantern layer. Click on the next layer below it and right click and select merge visible. Now X-out that bottom layer and the lantern layer. 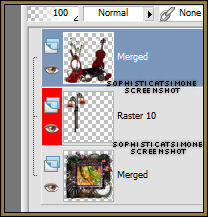 UN-hide all your other layers and then merge visible. You should have 3 layers now. You can add your copyright layer now and merge it down to the top layer. Activate your middle layer, the lantern layer. Grab your magic wand, tolerance set to 12, feather set to 0 and match mode set to RGB Value and Mode set to Add (shift). Now click on the brightest part of the light on both lanterns. Now go to Selections, modify and expand by 5. Now go to Selections, modify, feather, by 15. Select all, and go to Edit and copy merged. Go to Animation Shop, right click and paste as a new animation. Go to Edit and undo select all. Go to Edit and undo Brightness and contrast. Go to Animation Shop, right click on frame 1 and paste after selected frame. 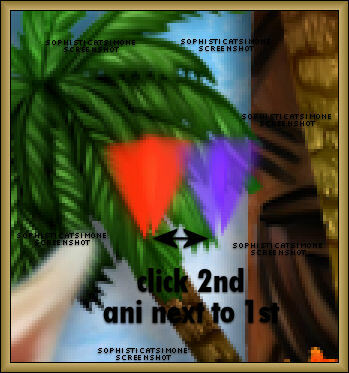 Go to Animation Shop, right click on the frame 2 and paste after selected frame.Come back to PSP. Do it all again, with a Brightness of 24. Paste after frame 3 in AS. Click on Frame 4. Go to Edit and paste after selected frame. Go to Animation, select Reverse frames. Go to View, and click on Animation. You can add your name and save. Tube of choice: I'm using Roxy by Diana Gali from SATC. Open Bibi Roxy Rocks Element (4). Copy and paste it as a new Image. Close original. Re-size new image by 90% at 72dpi. Copy and paste element (9) as a new layer and re-size by 70%. Re-position on your canvas as you like. Select your crop tool and snap crop rectangle to Merged Opaque. Go to Selections, Select all. Go to selections, Modify, contract by 10. Go to Selections, Feather, 15. Go to Selections, Invert and delete a couple of times by tapping delete key on your keyboard. Copy and paste element (75) as a new layer and re-size by 45% at 72dpi. Re-position on your canvas to the top. Copy and paste element (79) as a new layer and re-size by 100% at 72dpi. Move to the left side of your canvas. Copy and paste element (82) as a new layer and re-size by 100% at 72dpi. Move to the left side of your canvas. This layer should be below the speaker. So behind it. Copy and paste element (5) as a new layer and re-size by 40% at 72dpi. Re-position on your canvas to the left side of tag, in front of speaker. Copy and paste element (106) as a new layer and re-size by 100% at 72dpi. Move to the left side of your canvas at the top of tag and over the speaker. Copy and paste element (48) as a new layer and re-size by 36% at 72dpi. Move to the right side of your canvas at the top of tag and over the speaker. Copy and paste element (76) as a new layer and re-size by 57% at 72dpi. Move to the right side of your canvas at the bottom of tag and behind the speaker. Copy and paste element (58) as a new layer and re-size by 55% at 72dpi. Move to the center of your canvas and behind the barrels. Copy and paste element (6) as a new layer and re-size by 45% at 72dpi. Re-position on your canvas to the right side of tag, in front of speaker. Copy and paste element (54) as a new layer and re-size by 45% at 72dpi. Re-position on your canvas to the left side of tag, in behind the speaker and glow. bow tie I placed on the dog. Copy and paste your tube and re-size if needed. Add drop shadow of choice to all elements. Add background paper. I used paper 7. Open Mask of choice and apply to background paper. Add artist copyright and license number. Add scrap kit maker credit. Add your name and merge all visible and save as a PNG. If animating please do the following. Go to edit and UN-merge. 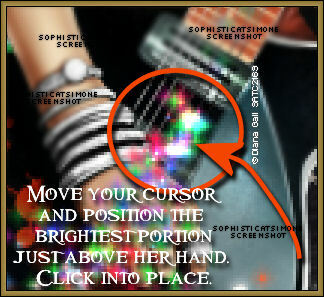 Tutorial written by SophisticatSimone aka Lorraine Halle on Monday, April 22, 2013. Tube of choice: I'm using Christie by Jose A Cano from SATC. Open a new image 700 x 700. Open element SS-E68 and copy. Paste as a new layer on your canvas. Re-size by 65%. Center for now. Copy and paste element SS-E53 as a new layer. Move to the upper right hand corner and under the photo frame. Duplicate, go to Image, free rotate to the left by 90 degrees. Move this layer to the left upper hand side. Duplicate, go to Image, free rotate to the left by 90 degrees. Move this layer to the left lower hand side. Duplicate, go to Image, free rotate to the left by 90 degrees. Move this layer to the right lower hand side. Hide your picture frame and merge visible. Click on the inside of the frame, the black area as well as the dark grey/black area. Copy and paste your tube close up as a new layer. Select your mover tool and position it side the selection. Go to selections, invert and delete. Go to selections, select all, go to Image, crop to selection. In layers palette, change blend mode on your tube to overlay or screen. X-out your splatter layer and merge visible. Add drop shadow to your picture frame. Copy and paste your tube as a new layer. Re-size if needed. I re-sized mine by 75%. Position and add drop shadow. Copy and paste element SS-E5 as a new layer. Move to the right side your tube and the bottom of tag and in layers palette move it as top layer. Add drop shadow. Copy and paste element SS-E60 as a new layer. Re-size by 60%. Move to the left side your tube and in layers palette move it below tube layer. Add drop shadow. pump. Move this element to lower left hand side of tag. Add drop shadow. this shoe a little to the left. Add drop shadow to each shoe. on the bottom of picture frame. Copy and paste element SS-E62 as a new layer. Re-size by 30%. Move to the left side your tag and move to upper left hand side of tag and add drop shadow. mirror. Flip and position over your picture frame in upper right hand side corner. Merge these two layers. Copy and paste it again and move behind your tube on the upper left hand side of tag. Behind the don't walk sign and in front of your picture frame. Copy and paste the following elements: E74, E54, E44, E23, E55 and re-size and position on your tag where you like. Add drop shadow to each. Copy and paste element SS-E31 as a new layer and move to the right side of your tag. Add drop shadow. Make it overlap your picture frame a little. Copy and paste element SS-E33 as a new layer and move to the left side of your tag. Add drop shadow. Make it overlap the gas pump. front of the black leaves. Add drop shadow. Duplicate and move to the right side of tag. Move behind the roses. Copy and paste paper 5 as a new layer on your tag and move to bottom. Crop merged Opaque. Go to Layers, New Mask Layer, from Image. Find mask in drop down list. Apply. In layers palette right click on mask and merge group. Add artist copyright and scrap kit maker credit. Merge visible. If you are not animating, add your name and save as PNG. If animating, go to selections, select all and copy. In Animation Shop, right click and paste as a new animation. Hold your Ctrl key down and repeatedly hit letter L on your keyboard for a total of 11 frames. Position on your tag, I placed the money low on tag near her knee and click into place. Position on your tag, I place the largest of the $ symbols on the speaker. Just move your cursor around you will see it and click into place. I added another layer of animation. Open SimoneAni-Dangerous-003, repeat the steps and make sure you place this one perfectly on the $ signs. Tutorial written by SophisticatSimone aka Lorraine Halle on Sunday, April 21, 2013. Plugin :Eye Candy 4000(gradient glow). Scrap Kit : Roxy Rocker by Disturbed Scraps from SATC. Using your mover tool, move close up until you see the face. Position to the right of tag. Grab your lasso tool, feather set to 12, on each layer remove any obstructing feather. With her, it's her hair. Look at my screen shot. On each layer I removed a portion of hair. Once you've completed that, flood fill Raster 1 layer (bottom layer) with black. Make sure your tag is active and go to Layers, New Mask Layer, From Image. Find mask in drop down list and apply. Copy and paste element 089 as a new layer on your tag and re-size by 80 %. Make sure it's your top layer and you can move it down low on your tag. Copy and paste your tube as a new layer. Re-size if needed. I re-sized mine by 30%. Copy and paste element 090 as a new layer and re-size by 62 %. Move below skyline layer. Position at top of tag. Add drop shadow. Copy and paste element 064 as a new layer and re-size by 74 %. Move onto the skyline layer at bottom. Copy and paste element 025 as a new layer and re-size by 84 %. Move onto the skyline layer at bottom. Copy and paste element 026 as a new layer and mirror. Move behind the skyline layer at top. Copy and paste element 082 as a new layer and re-size by 35%. Move to the top left hand side of tag. Add drop shadow. of skyline. Add drop shadow. Copy and paste element 061 as a new layer and re-size by 51%. Move as the top layer and center at the bottom of tag. Copy and paste element 099 as a new layer and re-size. Move on top of your barrel and add drop shadow. Copy and paste element 094 as a new layer and re-size by 28%. Move on top of your charm. Add drop shadow. Copy and paste element 114 as a new layer. Move to the left of tag. Move it below the charm in the layers palette. Go to Animation Shop and right click paste as a new animation. Position on your tag and click into place. I placed it low on tag near speaker. Remove 1 frame every 2 frames. You should be left with 10 frames. You can either do it animated like in the tutorial or still. set a check mark beside the second, third and forth choices. UN-check the 1st and last. At times your animation may or will come out terrible. Optimization in Animation Shop is not the greatest. You can play around will your settings, especially under the Tab: Optimization. I change this setting at times from anywhere between 70 and 100. Animation Properties, select Opaque and change color to white. Tutorial written by SophisticatSimone aka Lorraine Halle on Saturday, April 20, 2013. Tube of choice: I'm using the Blanche by SkyScraps from SATC. Open element 94. Copy and paste as a new layer and re-sizy by 50%. Free rotate 90 degrees to the right. Re-size canvas to 700 x 700. Move the frame to the right side of tag. Using your magic wand, feather 0, click inside the frame. Open paper of choice, I'm using paper 1. Copy and paste as a new layer and position area of choice within the frame. Move your paper below your frame. Duplicate the close up layer. Both layers should have blend mode set to Overlay. On the bottom close up layer blur the image by 3. On the paper layer below the frame and closeups, let's select it and Colorize. Copy and paste element 27 as a new layer. Re-size by 50%. Move this element on the left side of the frame and add drop shadow. 50%. Mirror and add drop shadow. frame and add drop shadow. frame, behind the castle and add drop shadow. frame, behind the castle, in front of mushrooms and add drop shadow. right side of frame/tag, duplicate and merge down. Duplicate and go to Image, Rotate, free rotate to the right by 90 degrees. above the frame layer. Add drop shadow to both. Copy and paste element 48 as a new layer and duplicate, merge down. Position as your top layer and in front of your tube and the bottom of tag. castle layer, but leave it on the left hand side of the tag. Duplicate and mirror. your frame layer. Add drop shadow to both logs. Copy and paste paper of choice as a new layer. I used the same paper (1). Move this paper to the very bottom. Select your crop tool, where it says "snap crop rectangle to:" select Merged Opaque. Double click on your tag. Let's add our mask to this layer. Merge group. Only the mask layers group. log layer. Add Drop shadow. of frame to the left. See my tag for reference. your tube. To the left of the frame. See my tag for reference. Add drop shadow. the second log, feathers, butterflies and rock. Those are all in the kit. Save as PNG if you are NOT animating. Programs : Paint Shop Pro, I'm using version 10. Animation Shop 3. Plugin : MuRa Copies, Redfield(seamless workshop), Eye Candy 4000(gradient glow). Font used: Do I like Stripes? Tube of choice : I'm using the sweet angelic tube Maria by Alexander McMillan from SATC. Let's make a tile first. Open a new image 500x500. Copy and paste your tube as a new image on this canvas. Go to Effects, Plugins, MuRa Copies. Select : Wallpaper/rotate. Default settings. Select your crop tool and select Merged Opaque. Go to Adjust, blur, gaussian blur, 25. Go to Effects, Reflection effects, Kaleidoscope. Click Preset 1 in the drop down box. Click on the green check make. You will empty space on your canvas, so copy this tile and paste as a new layer. Minimize and close the other one, we are done with it. Select pattern, and find the tile you just created. Activate your food fill tool and fill your image canvas with your pattern. Open BIBIMARIE ELEMS (8) from the kit. Go to Layers, New Mask Layer, from image. In layers palette, right click and merge group. Now copy and paste BIBIMARIE ELEMS (8) as a new layer on your mask layer. Copy and paste BIBIMARIE ELEMS (56) as a new layer on your tag. Copy and paste your tube as a new layer and re-size if you need to. I re-sized mine by 68%. Add drop shadow of choice. Copy and paste element 54 as a new layer and re-size by 45%. Move to the left side of tube. Add drop shadow of choice. Copy and paste element 55 as a new layer and re-size by 45%. Have this bear sit on the chair. Add drop shadow of choice. Copy and paste element 34 as a new layer and re-size by 70%. Move this layer below all other layers but above the mask layer. Have it peek out on the right hand side. Copy and paste element 36 as a new layer and re-size by 70%. This layer should be above the brown leaves. Free rotate to the right by 90 degrees. Have it peek out on the right hand side. Copy and paste element 16 as a new layer. Move to the right side of tube and as top layer. Add drop shadow of choice. Copy and paste element 59 as a new layer and re-size by 25%. Have this bird sit on bear's head. Add drop shadow of choice. Copy and paste element 3 as a new layer and re-size by 25%. Move as top layer and position to the left side of tag. Duplicate, free rotate by 90 degrees and move over a little bit. Line them up and add drop shadow to each one. Copy and paste element 22 and re-size. Move to the upper right hand side. Place above Mask layer and below the white element that was used as mask. Copy and paste element 25. Move to the upper right hand side. Place above the double frame layer. Add drop shadow. Copy and paste element 58 and re-size. Move to the left hand side of tag and place between the brown leaves and the white element. Using font : Do I like Stripes? Font size : 120 and your background material palette still set to your pattern. Add gradient glow using Eye Candy 4000. See my name tutorial HERE. Add large drop shadow: V=2, H=8, Opacity=50, Bur=10, Color=black. If you are animating please see any of my other animation tutorials and follow insturctions. I used SimoneAni396 for this tag. Tube of choice: I'm using the kitty tube found in her scrap kit "Fiesta Tropicana"
Open paper 02, duplicate and re-size by 87%, resolution 72 dpi. Close original. In Layers palette, right click and promote background to layer. Open your mask in PSP. I'm using Mask0100Sophisticatsimone. Make sure you activate your tag. Find the mask in Source window, check : Source luminance and UN-check : Invert mask data. In layers palette, right click on mask layer and merge group. Duplicate layer and merge down. Open element 116 and C/P as a new layer on your tag. Close original. Re-size by 60% and move the kitty down low on the tag. Add this drop shadow: V=-4, H=8, Opacity=83, Blur=15.94, Color=Black. Check : Shadow on new layer. Select your PICK tool. Your shadow layer will have nodes on it. Holding your shift key down, click on the lower left hand node and drag out about 1cm. Holding your shift key down, click on the upper left hand node and drag up and out to the left a little bit. Lower the opacity on this layer to 69 (If you find it too dark that is). Open element 41 and C/P as a new layer on your tag. Close original. 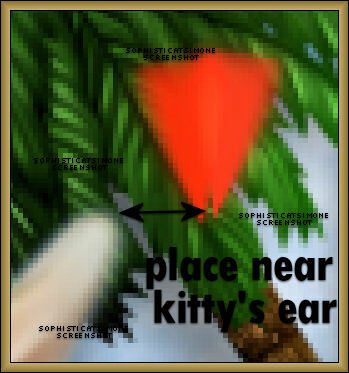 Re-size by 75% and move this palm tree to the right side of tag and below the cat in layers palette. Add this drop shadow: V=0, H=-12, Opacity=54, Blur=17.39, Color=Black. Uncheck : Shadow on new layer. Open element 117 and C/P as a new layer on your tag. Close original. Re-size by 60% and move the parrot in the upper left hand corner of your tag. Add this drop shadow: V=7, H=11, Opacity=51, Blur=14.49, Color=Black. Open element 45 and C/P as a new layer on your tag. Close original. Re-size by 30% and move the hut to the left of tag about midway on your tag. Add this drop shadow: V=1, H=4, Opacity=66, Blur=12, Color=Black. Open element 06 and C/P as a new layer on your tag. Close original. Re-size by 30% and move the leaf behind your kitty on the left side on your tag. Add this drop shadow: V=0, H=-3, Opacity=66, Blur=8, Color=Black. Open element 39 and C/P as a new layer on your tag. Close original. Re-size by 30% and move the drum to the right side of tag and kitty. In layers palette it should be the layer above the palm tree. Open element 38 and C/P as a new layer on your tag. Close original. Re-size by 35% and move the drink to the left side of tag. Add this drop shadow: V=0, H=6, Opacity=66, Blur=8, Color=Black. Open element 33 and C/P as a new layer on your tag. Close original. Re-size by 35% and move the flower behind the drum in layers palette and in front of palm tree. Wedge it between those two elements on the tag. Add this drop shadow: V=-4, H=-6, Opacity=47, Blur=12, Color=Black. Open element 36 and C/P as a new layer on your tag. Close original. Re-size by 30% and move the flower behind the yellow flower in layers palette and in front of palm tree. Duplicate layer and mirror. Move it near the kitty on the left hand side. On 1st big flower add this drop shadow: V=-4, H=-6, Opacity=47, Blur=12, Color=Black. On 2nd small flower add this drop shadow: V=3, H=-4, Opacity=57, Blur=8, Color=Black. Open element 32 and C/P as a new layer on your tag. Close original. Re-size by 38% and move the pineapple behind the drink and beside the flower. Add this drop shadow: V=3, H=-4, Opacity=57, Blur=8, Color=Black. Open element 48 and C/P as a new layer on your tag. Close original. Position behind the palm trees and to the right side of tag. Open element 61 and C/P as a new layer on your tag. Close original. Re-size by 23% and position this charm on your drum, dangling. Add this drop shadow: V=7, H=11, Opacity=50, Blur=14.49, Color=Black. Open element 76 and C/P as a new layer on your tag. Close original. Re-size by 19%. Duplicate. On top layer, change Blend Mode to Multiple. Merge down. Flip image and move down in front of kitty. Open element 114 and C/P as a new layer on your tag. Close original. Re-size by 46% and move behind the kitty. Duplicate and free rotate to the left by 25 degrees. On origianl add this drop shadow: V=0, H=-2, Opacity=66, Blur=8, Color=Black. On re-sized add this drop shadow: V=0, H=-3, Opacity=66, Blur=8, Color=Black. Re-size by 50% and mirror. Move this palm tree behind the kitty and all the little elements at the front. Add this drop shadow: V=-4, H=8, Opacity=63, Blur=15.94, Color=Black. Once you've positioned all elements the way you want on your tag, add artist copyright and scrap kit maker credit. You may also add your name at this time or wait until after the animation is added if you are making numerous tags for others. You can also at this time save as png and be finished. Hold Ctrl key down and tap letter L repeatedly for a total of 13 frames. Go to Edit, click Propagate Paste. Position the bug wings near the kitty. Position the bug wings near the first animation. Delete frames 2, 12, and 13. Or none at all, it's up to you. You can hold your ctrl key bottom as you click on those frames only. Once they are highlighted, hit your delete key on keyboard. If you are happy, save as gif. To use the same tube I did you need to add the tube to your cart and spend just $10.00 to get it as a free gift. I used Mask98SophisticatSimone on paper 3. I had to duplicate 4 time to get it to the opacity I liked. I also added noise to 30 on it. Go to File, New Image, 700 x 700. Add the paper you just used your mask on. C/P element 106 (window frame) as a new layer onto your canvas. Close original. C/P element 091 (horse) as a new layer onto your canvas. Close original. Re-size by 60%, 72 dpi. C/P element 032 (buckets with tap water) as a new layer onto your canvas. Close original. Re-size by 80%, 72 dpi. C/P element 076 (large rock) as a new layer onto your canvas. Close original. Re-size by 80%, 72 dpi. C/P element 090 (pink cap mushrooms) as a new layer onto your canvas. Close original. Re-size by 46%, 72 dpi. C/P element 092 (pink foliage) as a new layer onto your canvas. Close original. Re-size by 25%, 72 dpi. Cluster your mushrooms and foliage on the right hand side of the pond. C/P element 002 (green foliage) as a new layer onto your canvas. Close original. Re-size by 25%, 72 dpi. 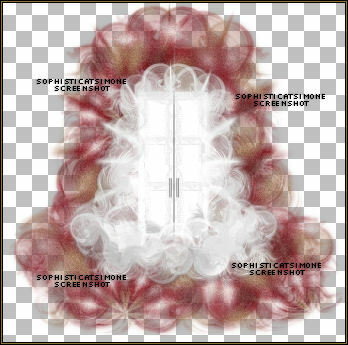 C/P element 109 (bouquet of flowers) as a new layer onto your canvas. Close original. Re-size by 25%, 72 dpi. Add to your mushroom and foliage cluster on the right side of pond. C/P element 093 (purple hill) as a new layer onto your canvas. Close original. Position behind the fountain and the water pond. Duplicate and re-size by 40% and position in front of pond. C/P a few the rocks and re-size them differently and just scatter them around the pond. Ok now we are going to promote a portion of the rock that's a part of the pond. Grab your selection tool, set to Freehand selection, point to point, add (shift), feather 0, smoothing 0, anti-alias checked. Zoom in a lot on the area and reduce opacity on any layer that is above that rock, so you can see it well. Click around the rock, very close to edge. Once you get back to the start point, right click to join the ends. 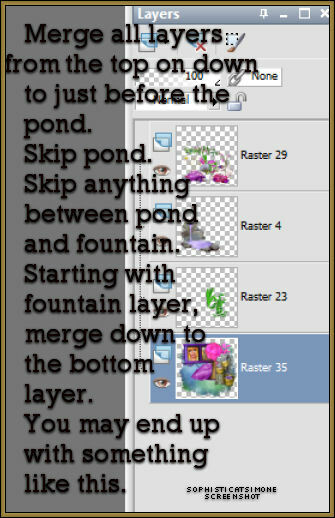 On your pond layer in layers palette, right click and promote selection to layer. Move this layer above any foliage or flower you have on the edge of the pond. De-select. C/P element 095 (pink tree) as a new layer onto your canvas. Close original. Re-size by 80%, 72 dpi. Re-size again by 80%. Move to the back behind the fountain and in front of purple hill. C/P element 045 (branch with dragonflies) as a new layer onto your canvas. Close original. Move over window frame at the bottom edge. C/P element 046 (flowers) as a new layer onto your canvas. Close original. Re-size by 31%. Move to the bottom edge of the pond. C/P element 108 (pink flower) as a new layer onto your canvas. Close original. Re-size by 31%. Move to left hand side of tag. If you placed rocks in front of the purple hill, just place the flower on top to them. fountain layer and your pond layer. Position near the right side edge of pond. OK now what you need to do is just add a bunch of little flowers, branches, leaves, etc. Rotate them, mirror them, flip them, etc. Remember to add drop shadows to all your layers. Be creative and make this your own. The rabbit is a tube that comes with the special commission by Lady Mishka. You can get this tube at SATC when you make a purchase of $10 or more. You just add it to your basket and you can download right away. Select the inside of your window frame and add paper of choice. Delete extra. Now paste your tube of choice and position where you would like. Delete extra. 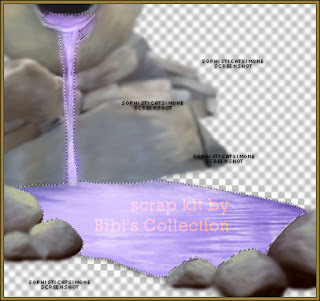 Add copyright info and scrap kit credit. Add(shift), feather of 0 and smoothing of 0. Anti-alias checked. right click on it in the layers palette and merge down. Keep merging down till you get to the pond. Then you can x-out that layer. On your pond layer, select all the water. You will need to zoom in and click nice and close to the edges. Try your best not to include any of the grey rock. Do quick and short clicks. Once your finished with the pond, select your fountain in the layers palette and do the same. OK so now you will need to add the effect/plugin filter to each of these layers. You will be doing a lot of back and forth because you're applying two different filters to two different layers. So go to Effects, plugins, dsb flux, bright noise, Intensity 35, Mix checked. In layers palette activate the next layer. It should be your pond, but not a big deal if it's the opposite. Now go to Effects, plugins, VM Nature, Sparkle. All other settings leave at 255 except the Random Seed is 52. Click OK, repeat again on the same layer and change random seed to 62. In layers Palette activate the next layer and do the same thing. Go to Edit, Copy Merged. Paste as a new animation in Animation Shop. Back in PSP, go to Edit, and Undo until you get through the Sparkle effect and the noise effect. When applying the dsb flux noise, just click twice on the checked MAX, it will scramble the noise. When applying the sparkle effect, change the random seed to 55 and 65 (because you're doing it twice remember). Go to Selections, select all, unhide all and copy merged. In AS, right click on the current frame and paste, paste behind current frame. Back in PSP, undo all effects (sparkle and noise). Make sure you always do the noise effect before you do the sparkle effect otherwise you won't see the sparkle. current frame. Now you have 3 frames. Play. If you are happy with the effect, save your tag. Add name. I used Paper 19 as background fill for the name. Add gradient glow and drop shadow. Add to your tag in AS. 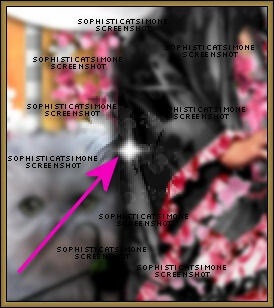 Tutorial written by SophisticatSimone aka Lorraine Halle on Saturday, April 13, 2013. Supplies needed to complete this tutorial. Programs: Paint Shop Pro, I'm using version 10. Open Paper014, duplicate and close original. Re-size by 90% and at 72 dpi (resolution). New Mask Layer, from image. In source window select the mask. Create mask from : source luminance and leave UN-checked Invert mask data. 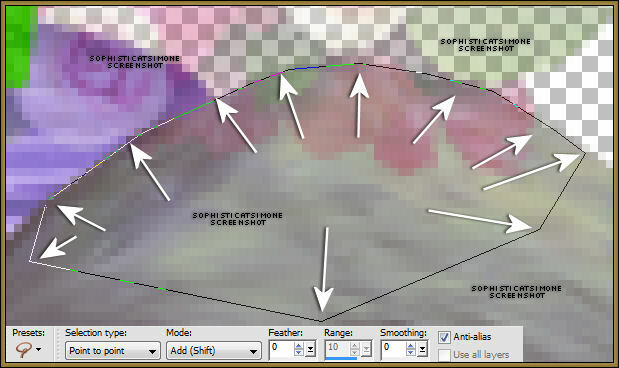 Right click on your paper in the layers palette and select merge group. C/P element 013 as a new layer. On one layer, free rotate to the left by 30 degrees. On the next layer, free rotate to the right by 40 degrees. Arrange all to the left of the tag. Add drop shadow to each. I used, V=0, H=-5, Opacity=74, Blur=9, color=black. C/P element 090 as a new layer. Rotate to the left by 90 degrees. Re-size by 75%. Move to the right of the tag. Select your magic wand, feather set to zero, tolerance set to 10. Click in the middle of the frame. Go to selections, modify, expand by 6. C/P a close up of your tube. With your mover tool, position the area of the tube you want to see in the frame. Move the close up under the frame layer. Using your crop tool, snap crop rectangle to: merged opaque. Duplicate your close up tube. On bottom layer of tube, blur by 4. On the duplicated layer, set blend mode to Screen. X-out all layers except the frame and the two close up layers. Add drop shadow to frame. UN-x your other layers now. C/P your tube as a new layer and re-size if you need too. Position to the left of the frame. C/P element 039 as a new layer. Re-size by 50%. Position to the left of the tag. C/P element 009 as a new layer. Re-size by 50%. Position to the right of the shoes. C/P element 012 as a new layer. Position this layer under your tube and frame layers. Move to the left and over the leaves. C/P element 006 as a new layer. Position this layer under your tube and frame layers. Move to the top of the tag. Should appear behind frame at top. C/P element 054 as a new layer. Re-size by 50%. Position to the right hand side of tag. edge of frame. Add drop shadow. Add any other elements that you feel would look good or add to the look you are achieving. Add artist copyright and scrap kit maker information. Add noise: 77%, random checked, monochrome checked. Add small drop shadow: V=0, H=-1, Opacity=88, Blur=1, Color=black. Merge visible and save as PNG.